Canadian Construction Association (CCA) is a founding member of the Canadian Construction Innovations (CCI). 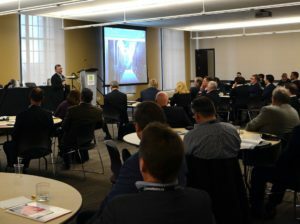 CCA’s Innovation and Technology Committee gets regular reports from CCI as part of its mandate to identify trends and technologies that may affect the Canadian construction industry. 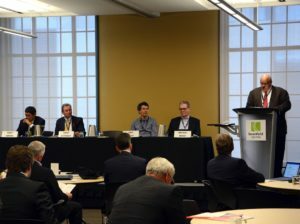 John Bockstael, CCA’s 2nd national vice-chair, also CCI chair, as well as Ken Lancastle, CCA’s director of industry trends and practices and permanent secretary of the Innovation and Technology Committee, attended CCI’s inaugural conference on November 3 in Toronto. 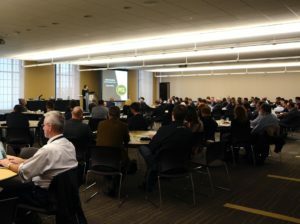 Once the inaugural Canadian Construction Innovations (CCI) conference wrapped up, one thing became abundantly clear: not only is the industry on the precipice of massive change, but much of that change and evolution is already well underway. 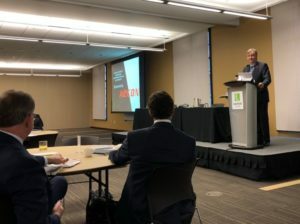 Summarizing several of the findings in the World Economic Forum report on the future of construction, Mathew Kattapuram of AECON Group made a clear-cut case for why construction needs to improve its productivity. Globally, he pointed out, just a one per cent improvement in construction productivity could equal $100 billion in savings. He also noted that even through improvements to the approval process and regulatory reform, the subsequent improvements to productivity could allow for more than $1 trillion of infrastructure investment by 2030. 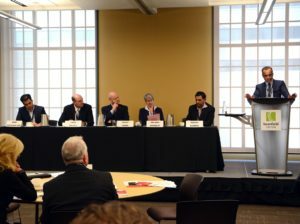 Mathew also took the opportunity to outline four of the major megatrends that will impact construction: a changing marketplace and customers; a growing need for sustainability and resiliency in design and construction; different societal and workforce realities; and, shifting political and regulatory environments. The construction industry faces several challenges that it must overcome to make these changes. The first is that the industry remains highly fragmented. 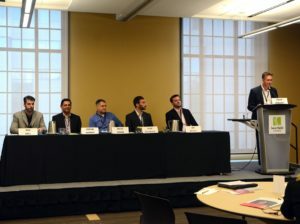 Another challenge, as one panelist stated, is that a lot of what happens in the industry is based on “rules of thumb,” or proceeding with the status quo. One of the biggest innovations likely to impact construction is artificial intelligence combined with the availability of data from job sites. Whether it is sensors in mobile phones able to track activity, or high-resolution visual data available from drones and video cameras, the availability of this data, in combination with artificial intelligence, has the potential to revolutionize how work is done in construction. As an example, high resolution imagery of a job site can be overlaid with the building information modeling (BIM) model (which includes 4D planning of the project) to determine whether a project is on time, ahead of schedule or falling behind. Using predictive data analytics, the risk for potential delays — as it relates to the project look-ahead schedule — is also analyzed. Other examples include the ability to map out worker movement to help determine whether time savings exist for specific tasks. As more data on worker activity becomes available, lessons learned in productivity and safety can be shared with the team. As governments and project owners begin to look at the lifecycle cost of their assets, reduce greenhouse gas emissions, and seek out more sustainable solutions, the construction and design industry will have an important role to play. Energy-efficient technology and systems in buildings, low-carbon material, and passive design strategies that utilize ambient energy sources are all means and methods that can address a growing desire for sustainability. Here as well, sensors and data collection tools will play an important role in feeding information to facility managers to help better manage the environmental impact of buildings. To that point, there is also growing discussion around Smart Cities, where data collection tools throughout a city will feed information to city managers to help better manage and monitor assets. In Canada, Infrastructure Canada is preparing to launch a Smart Cities Challenge, announced in Budget 2017, that will see the federal government provide funding and work in collaboration with communities that are ready to innovate in this area. Visit ccinnovations.ca to learn more about CCI. Visit eepurl.com/W8PE9 to subscribe to CCA Weekly, our weekly e-newsletter which includes innovation and technology news relevant to the construction industry.